A unique database, abundantly illustrated with realistic prices and powerful collection management features, NumiX Euro 2019 is finally available for download with 827 new coins and coin sets, and new reports. Warning : In trial version, some countries and some face values are not available, thumbnail view is slow at startup, and collection symbols don't appear. Buy the license to access all coins and fast! NumiX Euro is both a generous catalog of Euro coins and a pleasant companion to manage your collection. 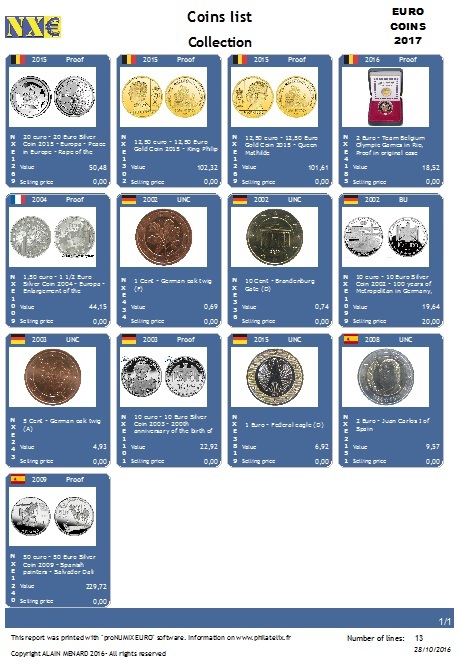 It lists all the circulation Euro coins and all the gold and silver commemorative coins from all eurozone, as well as starter kits, BU and Proof sets and contains a lot of details for each coin. NumiX Euro illustrates 9596 coins for different presentations. All NumiX Euro prices are true market prices. The average is calculated from several million sales in major auction websites, sales from relevant online shops, online shopping portals, as well as price lists and catalogues from retailers. 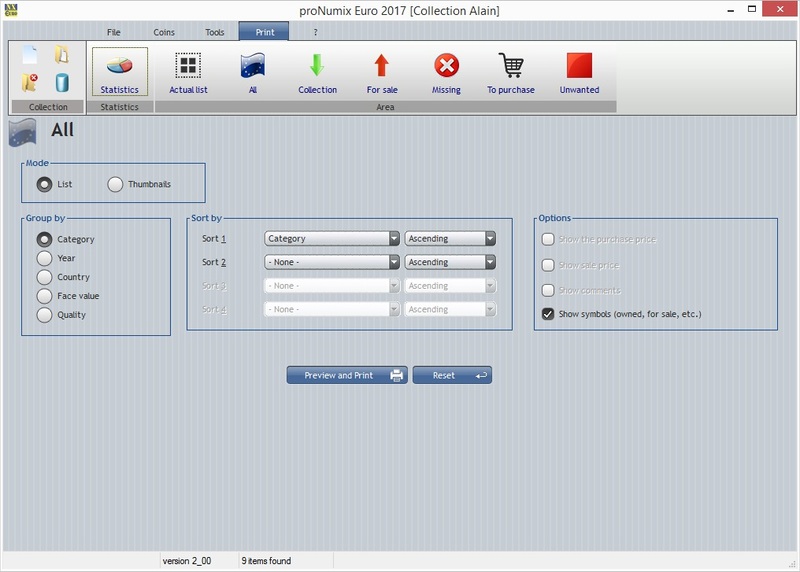 NumiX Euro has many features to easily manage your collection. Thumbnails view is directly displayed when NumiX Euro is started. 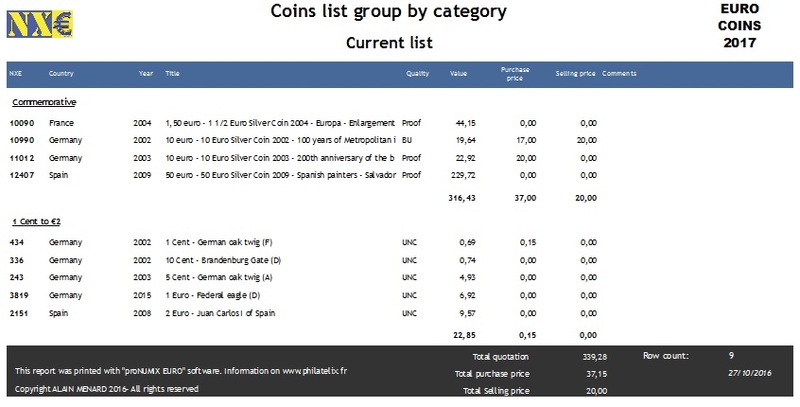 It displays all of the 9596 coins with essential informations such as country, year, price, title and picture. 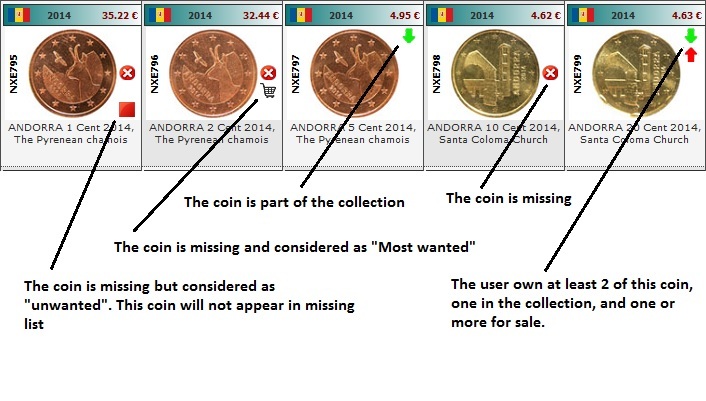 If the collection is open, symbols are different depending on whether the coins are part of the collection, for sale, or are declared to buy or not to collect. Define selection criteria facilitates the search of a coin. This is a common operation to reduce the number of visible thumbnails. All selection criteria can be combined to reduce the list of thumbnails. 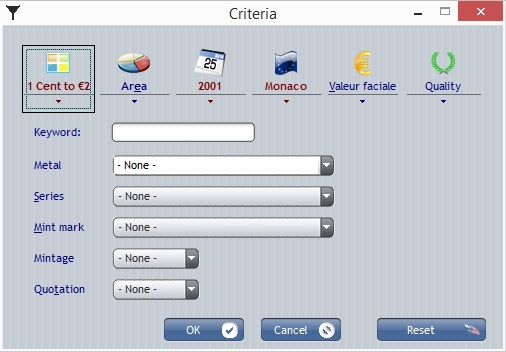 Criteria are visible in the "coins" menu and designate the criteria displayed directly on the ribbon (the upper part of the window). but the visible criteria on the ribbon are only part of the available criteria. The Main view is displayed either by double-clicking on any thumbnail, or by clicking the "Main view" button. It shows all the coin characteristics and its quotation. Note that if a collection is open, the Main view also shows personal datas. 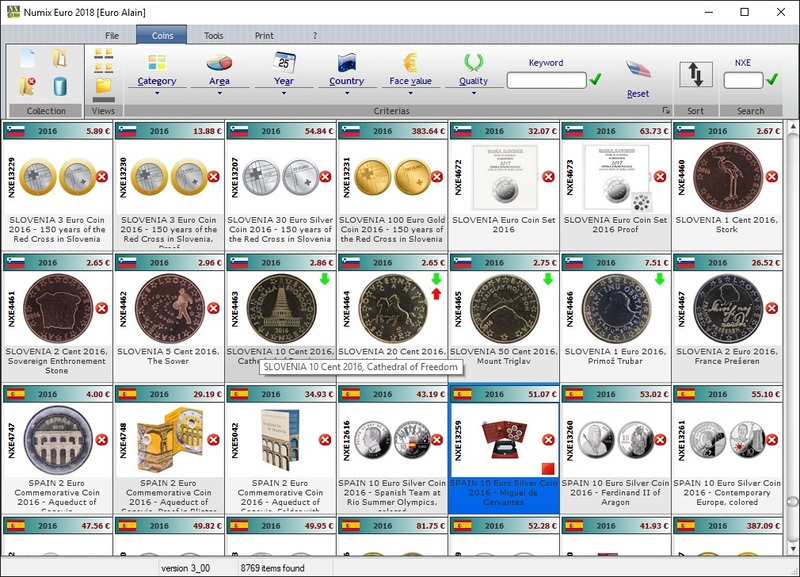 A tab is displayed below the picture with respectively the "Collection" section that lets you add or customize your coins, and the "Additional Information" section which serves to complete the general characteristics of the coin. Date of entry: The default date is today and represents the day the current coin was added in NUMIX EURO. 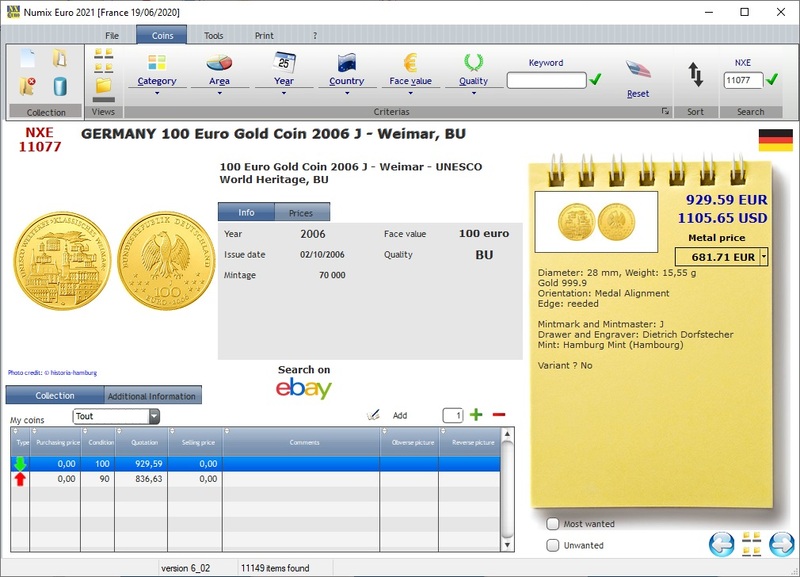 Type: Specifies whether the coin should be kept (Collection) or for sale. Purchase price: Price the coin was acquired. This data may appear on some print reports. Seller: Company or person who sold you the coin. Selling price: Price at which you would like to sell the coin. This data may appear on some print reports. 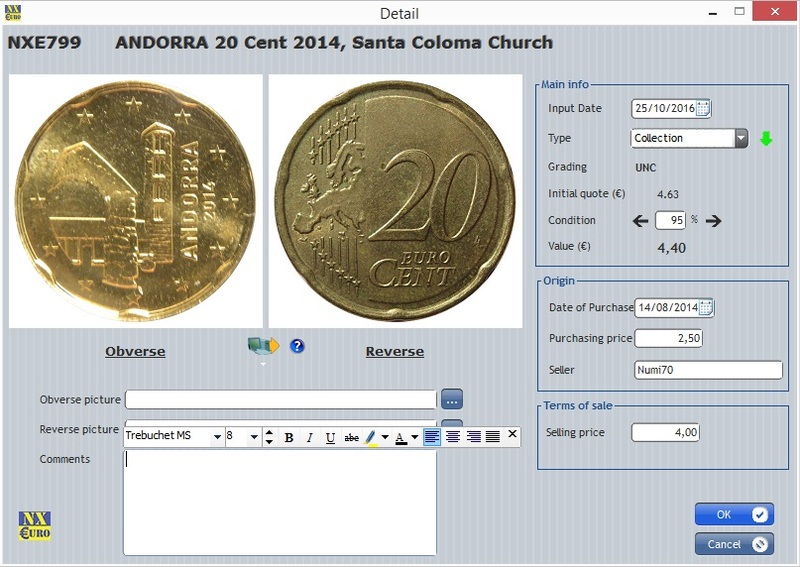 NumiX Euro allows you to print many coins lists according to selected parameters, as lists or thumbnails. 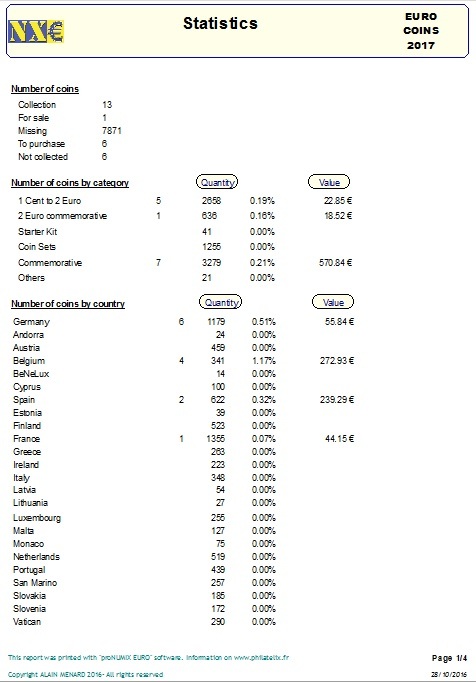 The Statistics report displays extensive information on the current progress of your collection.